It is with great sadness that we report the passing of the Ribnitzer Rebbetzin, Rebbetzin Freida Milka Abramowitz a”h. 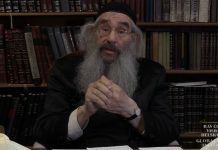 The Rebbetzin was the second wife of the Ribnitzer Rebbe, Rav Chaim Zanvil Abramowitz zt”l, originally from Rybnitsa, which is now in Transnistria, Moldova. The Rebbe lived in the USSR under Communist rule and lived a full Torah life. Famously, the Russian gentiles feared and revered the Rebbe and the KGB brought their wives and children for blessings and experienced miracles. The Rebbe was a great tzaddik whose avodas Hashem was legendary. The Rebbe left Russia in 1970 and moved to the Mattersdorf section of Yerushalayim, where he lived for a few years before moving to the United States. He lived in Miami, Los Angeles, Boro Park, Sea Gate, Brooklyn, and finally Monsey, New York. The Rebbe had lost his first wife and remarried to Rebbetzin Freida Milka. The Rebbetzin was supremely devoted to her husband and allowed him to fully immerse himself in avodas Hashem and help the many Yidden who sought out his counsel and chizuk. The Rebbe passed away on Isru Chag Sukkos in 1995 in in Monsey, New York. The levayah will take place this morning, at 10 a.m., at 50 South Main Street in Spring Valley, NY, followed by kevurah.